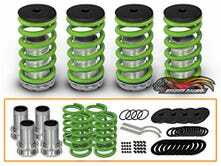 I was screwing around on Amazon trying to find some lowering springs and found these things... what on earth? Does the sleeve slip over the lower part of the strut so you can change the ride height or something? Wouldn't it need welded? People keep saying the ride is bouncy... I'm guessing that's because they're using it with stock shocks that can't match the higher spring rate? Has anybody ever used anything like this? These seem too cheap to be true. I might just try to find some lowering springs with a close-to-stock spring rate.